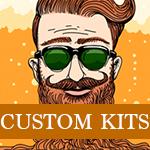 What are home brew beer kits? Most homebrewing beer kits are made up of isomerised liquid malt extract and you brew them by simply rehydrating the liquid malt and fermenting them with the included sachet of yeast. Is it possible to brew good beer from beer kits? Modern day homebrew beer kits have advanced in quality significantly and you can brew fantastic quality beers with ease, the new beer kits from Mangrove Jacks even have Sour Beer Kits and Barrel Aged Beer Kit styles that are what craft beer lovers are looking for in the market. What do I need to brew a beer kit? Tips for Successful Beer Kit Brewing? It's simple to make good beer if you follow the following ; Sterilsation - make sure everything s sterile that you are using during the process and this is simple to do with our Geterbrewed Oxi No Rinse product. Read the instructions and finally make sure the fermentation temperature is monitored, you want to acheive a constant fermentation temperature. If you need any help getting started to make your own beer or have any questions about beer making then get in touch via email info@geterbrewed.com or pop us a message on one of the Geterbrewed social media channels.